Kaya Skin Clinic, the largest international skin care clinic in Middle East, which caters to mainly women clients, has the potential to spread awareness about this cause and shed light on the importance of self-examination for higher cure rates. The brand has been continuously and actively supporting this cause over the past 5 years. The campaign #POWEROFTHREE, which has been getting an amazing response last year continues this year aiming at changing the conversation from BREAST Cancer to BREAST Cancer! 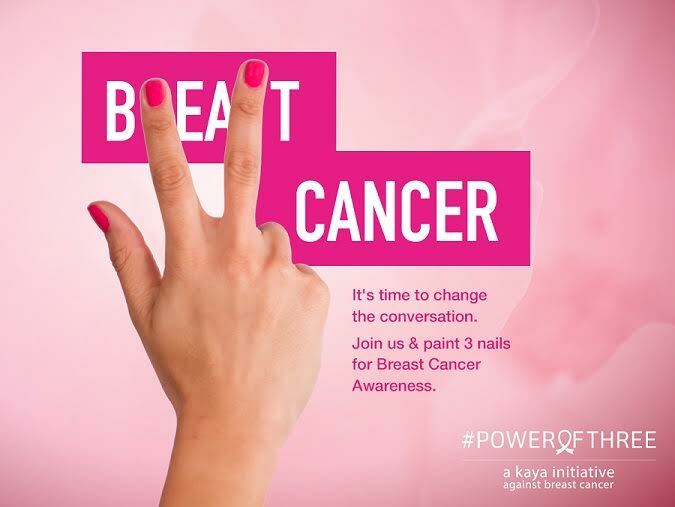 The #POWEROFTHREE is inspired by the importance of the three fingers which are used to do the breast self-examination for early detection, which drastically increases the cure rates. That’s where the brand requests its clients to paint those 3 fingernails pink, as a pledge that they’ve done the self-examination and invite others to do it. For the entire month of October, clients cannot help but notice the pop of pink, across its 21 clinics in the region, and ride on the strength of social media to take it viral. Women across can join the drive by clicking pictures of their first 3 painted fingernails and post them on various forums while tagging the brand’s social media pages with the hashtag #POWEROFTHREE.